Outdoor Ice Skating in the Desert? You Betcha! A festive holiday seems to be associated with warm glowing fires, children bundled up and wearing mittens building a snowman and drinking hot cocoa. In the Phoenix area, although it does get cold and we might get an occasional dusting of snow, we usually have to manufacture our own cold and wet stuff. The good news is, you won't have to shovel it! When the Christmas holiday season comes around, you'll find several attractions, malls and festivals that feature snow, snow flurries, and skating rinks. Some of those skating rinks will be synthetic, and some will feature real ice. In Glendale, Arizona in the West Valley at Westgate Entertainment District, you'll find the real thing. It's Skate Westgate. November 22, 2016 through January 8, 2017 as outlined below. It is even open on Christmas Day! 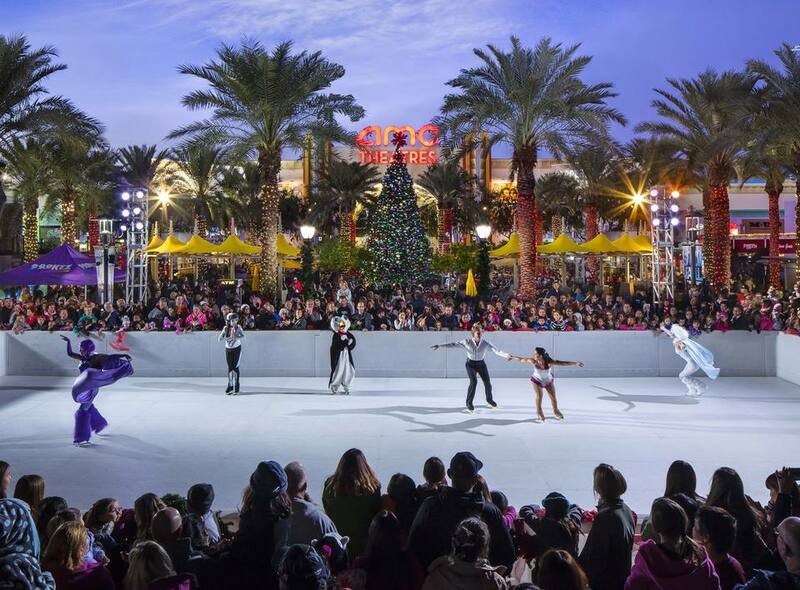 On opening night, Tuesday, November 22, 2016, there will be a professional skating performance followed by the lighting of Westgate's 33-foot holiday tree and Santa's official arrival. At 7 p.m. it will magically snow for the first time and Skate Westgate will open. Santa will be available for photos from 7 p.m. - 9 p.m. The ice rink will be open until midnight. Free admission, skating fees apply. Sunday through Thursday: 5 p.m. to 11 p.m.
Westgate Entertainment District is in Glendale. Here is a map with directions to Westgate. This location is NOT accessible by light rail. Pricing includes skate rental and two-hour skate session. Bring your own socks and gloves or purchase them onsite. Westgate Entertainment District will be a busy place with holiday happenings all month long. Check the holiday activities listing for more details. You may purchase tickets at the rink. Wear your Arizona Cardinals or Arizona Coyotes team jersey and receive $2 off your admission ticket. Offer valid every Sunday with show of same-day wristband. Not valid on Dec. 25. Not valid with any other coupons or discounts. One discount or offer per customer, per day. Expires 1/8/17. There is free parking in the lots around Westgate Entertainment District. For more information: Visit Westgate Skate online. Are There Other Holiday Activities and Performances Around Town? Of course! There are hundreds of them! Check out the Big Phoenix Holiday Guide.